Its very existence at stake, the crisis-ridden European Community seeks a strong political solution to otherwise unresolvable problems. ONE QUESTION frequently asked by new readers is, "What is this European Community or Common Market you so often write about, and why is it so important?" For more than a quarter century — since the Common Market began operations in 1958 — The Plain Truth has regularly focused the attention of its readers on this dynamic association of West European nations, now the world's largest trading bloc. With the dramatic increase in our circulation, it is time, once again, to do so. Here is the real meaning behind current efforts to unify Europe! Thirty-nine years ago, the continent of Europe lay in ruins, devastated by world war. Europeans had been their own worst enemies. As recovery slowly got under way, the war-ravaged nations of Europe began searching for a means of avoiding such catastrophes in the future. How might they override the deep-seated jealousies and hatreds of the past, the constant rivalry and repeated wars? European statesmen suggested that if Europe's individual national isms could be submerged within the context of European supranationalism — if European interests could be placed above national allegiances — future conflagrations might be averted. In this vein, Sir Winston Churchill, in a celebrated speech at Zurich in September 1946, issued a dramatic call for the creation of a "United States of Europe." Many caught a glimpse of his vision of a federated Europe as a means of developing a sense of common identity. As a first step toward European integration, a plan was devised to pool the iron, coal and steel resources of France and West Germany under a single high authority. If the economic destinies of Europe's two arch-rivals could be bound tightly together, proponents reasoned, another intra-European war simply could not occur. The project was extended to include Italy, Belgium, the Netherlands and Luxembourg. This economic venture was called the European Coal and Steel Community (ECSC). The Community began operations in July of 1952. This was the first large-scale European organization to be given supranational authority by its members. The immediate success of this pilot project quickly showed Europeans the advantages of cooperation. They began to comprehend just how powerful they might become, if they combined their resources. Here was a chance — maybe their only chance — to regain some of the power and influence they once enjoyed! Thus began the Continent's economic resurrection from the graveyard of war. But a major problem hindered further progress. Tariffs, import quotas and other trade restrictions kept the nations of Western Europe from trading freely with each other. An automobile manufactured in West Germany, for example, could not be sold in France or Italy without payment of a high tariff. This raised the price of the automobile to non-German buyers and thus limited the market for that automobile. The next logical step was therefore to knock down the tariff walls that divided the six Western European countries in the Community and let goods move freely from one country to another. This, proponents declared, would expand the markets of member nations and increase their economic efficiency. With the signing of the Treaty of Rome on March 25, 1957, just such a plan was launched. The European Economic Community (EEC) — popularly called the Common Market — officially came into operation on January 1, 1958. Its six charter members were the same countries associated in the ECSC. Another authority, the European Atomic Energy Community (EAEC or Euratom), was created at the same time for the joint exploitation of atomic energy for peaceful purposes. All three Communities — the ECSC, EEC and EAEC — are today administered by the same governing institutions. The collective term European Community (or EC) is now used as a colloquial shorthand for the three. Today, at its headquarters in Brussels, Belgium, more than 10,000 Eurocrats administer this huge 10-nation free-trading area. In the years since its inception, the Community has become the world's largest trading bloc. And it has created a vast network of preferential trading agreements with dozens of nations worldwide. But the business of the European Community is not just business. Although the EC's field of action is largely economic, its founders' aims were essentially political. From the start, European planners envisioned the Community as the nucleus of a future political "United States of Europe" with a centralized political authority. Economic integration would be only the start. The ultimate product would be an entirely new political entity! Many, even in those early years, saw the Community evolving into a strong politico-economic power, a European counterweight to Soviet Russia. And indeed, strides have been made over the years in the political arena. In June 1979, for example, voters in the EC member nations went to the polls to choose, for the first time, directly elected representatives to the enlarged and strengthened European Parliament in Strasbourg, France. This was an enormous milestone in European history. But the old nemesis of self-centered nationalism still impedes progress. As yet, the EC's decision-making institutions are invested with few substantial powers. Only minimal surrender of national sovereignty has taken place. National self-interest still dictates governments' positions in EC negotiations, notably in the area of agricultural policy. Quarrels over how the EC spends its money have even prompted some observers to suggest the possibility of a Common Market collapse! The EC faces a series of crucial decisions in the near future. Most Europeans realize there can be no going back. Many remain hopeful that the remaining years of this century will yet witness a coherent, full-functioning United States of Europe. 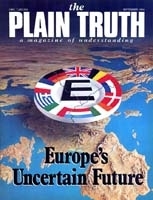 Bible prophecy — as so often explained in the pages of this magazine — reveals that a powerful New Europe is on the horizon! The Bible foretells a gigantic world-trading system to be formed in our time, possessing worldwide political power and influence. Ultimately, this prophesied New Europe will possess greater population, greater industrial and economic capacity, and greater military power than either the Soviet Union or the United States now possesses! "It is one of the crucial developments of world history. It is bringing to life a slumbering giant. It is developing into — creating — a GIANT NEW WORLD POWER, that will be mightier than either Russia or the United States! It is swiftly, dynamically, fulfilling PROPHECY! It is resurrecting the ROMAN EMPIRE!" (Plain Truth, September 1961). The dream of a united Europe has permeated the history of the Continent. The original Roman Empire fell in A.D. 476. But Bible prophecy revealed it was to be restored again and again over the centuries. The most recent attempt to revive the Roman Empire was by Benito Mussolini. Today we see the last resurrection of the Roman Empire springing to economic life! It will be composed of 10 nations or blocs of nations — but not necessarily the 10 now associated in the EC. The final political union in Europe will not come about through slow, evolutionary means, but suddenly — in reaction to dire external threats to the Continent's very existence! The "founding father" of the Common Market, Jean Monnet, foresaw this when he remarked that "necessity is the real federator." The years just ahead will provide the specific events that will t rigger the final, sudden, desperate fusion of Europe. Moreover, prophecy reveals that religion will have its part to play in inspiring enthusiasm for European unity. The Roman Catholic Church, locked in a struggle with Soviet atheism and U.S. secular consumerism, will reassume its historic role as a "glue" for Europe, cementing together the diverse peoples and cultures of the Continent. Europe stands on the threshold of unparalleled world power. By virtue of its economic dynamism, political muscle and continuing need for Middle Eastern oil, the coming United Europe will be in a position to reshape the geopolitical balance of the world! But will this new power be able to avoid conflict with today's superpowers as she herself rises to superpower status? Read our revealing free booklet The United States And Britain In Prophecy for the startling answer. The last, climactic revival of the Roman Empire is even now in the making. Prophecy is fast being fulfilled, especially in the Middle East. This European political-economic-military-religious empire will have a profound effect on the future of the world — and on the lives of all our readers. That's why The Plain Truth continues to closely follow ongoing developments in the European Community!